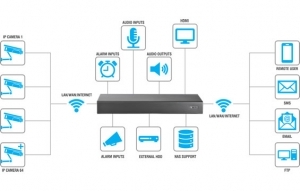 Home/Network Video Recorder/How to Choose the Best Network Video Recorder for your Business? Security for any business is imperative. After all, how do you plan to earn profits if you cannot manage to protect your assets? Security being a global concern for all kinds of businesses, companies providing security has managed to offer varying security solutions. However, the best solution may not always be the best for your business, so it is advisable to wisely choose solutions for your company’s optimized security. One of the widely used security solutions for enterprises is the NVR Video Surveillance Systems. With the use of latest technologies and keeping in mind the existing security requirements they have time and again proved to be the most effective for small to extremely large enterprises. What is a Network Video Recorder? Network Video Recorders are responsible for collecting and storing the videos captured by a group of cameras in the network. The NVR recorders for IP Cameras are ONVIF compliant, enabling third party cameras for monitoring. They also provide them with the flexibility of deploying cameras of a different brand according to the requirements. Network Video Recorders are capable of streaming audio/video data over a single cable, hence providing better security. Network Video Recorders facilitate multi-floor as well as multi location monitoring of a cameras without the need of a separate server for centralized monitoring. Camera-wise flexibility to assign number of retention days as per the importance of camera allows for flexible data storage. By using latest compression techniques like H.256 helps reduce storage space consumption up to 50%. Providing different level of authorization for users as well as allow/deny selected series of IP/Mac addresses from accessing data provides high level of Data Security. Time-lineand event based search can be conducted for quick investigation. According to the latest security requirement it is must to have recorders that can record as well decode images in 4K resolution. Better the quality of the images, easier it will be to detect the activities. Better compression techniques like 265 help reduce extra cost on storage and bandwidth, hence optimizing the storage space and retaining data for more number of days without needing additional storage devices. Efficient recording at high resolution requires device with higher throughput to stream the data and sustain the video quality. The recorder should be powerful to record as well as decode 2, 4, 8, 16 channels of cameras in high resolution along with a play back options. Higher RAID level support with RAID-5 and RAID-10 for data redundancy is provided so that no important data or file is lost. Since the data that gets recorded is on the heavier side, network recorders must have the capacity to attach hard disks of at least 10TB per each SATA slot. Matrix is one of the leading NVR manufacturers and has adopted the changes in the security sector. It aims at providing its best products and delivering them to their valuable customers, with a free product demonstration. With various products lined up, the choice becomes easy for customers to get a customized product according to their enterprise requirements. A Network Video Recorder can have many variants ranging from 8 channels to 64 channels to serve a small as well as an extremely large enterprise.